This week I had shown how to use Debug Diagnostic tool to capture a dump for a first chance exception encountered by an application and perform analysis using the Crash Analysis rule. Today I am going to show to use Debug Diagnostic tool to track outstanding memory allocations for a process. 1. Launch the Debug Diagnostic tool and click on the Rules tab. Click on Add Rule. 5. Click on the Configure button and you can then configured additional options for the userdump generation for the process being tracked. I also have the tool set to automatically capture a user dump if the process that I am tracking unexpectedly shuts down. (Configure userdumps for Leak Rule window below in screenshot). I have configured the rule to capture a dump automatically if the process unexpectedly shuts down. (Option: Auto-create a crash rule to get userdump on unexpected process exit). Additionally, I have configured the rule to capture a userdump once the private bytes for the process reaches 350MB. (Option: Generate a userdump when private bytes reach x MB). As you can see in the screenshot below, there are additional options that you can configure but I don’t need them for this particular demo. 6. Next you get the “Select Dump Location and Rule Name” window where you can changed the rule name and the location of the dumps generation. By default the dumps are generated at <Debug Diagnostic Install Path>\Logs\<Rule Name> folder. 7. Click on Activate Rule in the next window to start the tracking. Note: If you are not in the same session as the Debug Diag Service, then you will get the following message when you get the following pop-up, once you have configured the rule. Click on Yes. And then you should get a pop-up stating that Debug Diag is monitoring the EXE for leaks. Process MemAllocApp.exe(15316) is in the same logon session as DebugDiag (session 2), but it is not in the same logon session as the DbgSvc service (session 0). Do you want to return to ‘Offline Mode’ and continue? On the Rules tab, you should see two rules. One for the leak tracking and the other for the crash rule. Once I hit the threshold of 350MB of privates bytes, I will a dump generated and the Userdump Count column value should change to 1. I was monitoring my application’s Private Bytes perfmon counter and the graph showed a steady increase. (see screenshot below). 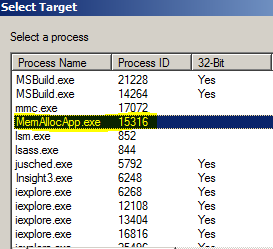 Now that the rule is active, I can find that the Being Debugged column has the value “Yes” and the LeakTrack Status column value will be Tracking for MemAllocApp.exe under the Processes tabs. I then used the Analyze Data button under the Rules tab to generate the memory tracking report of a memory dump that I had captured earlier which I analyzed and these are a few excerpts from the report. This clearly tells me that the memory allocations are coming from the Native Heaps. And I know from the previous screen-shot that Heap Allocation functions (HeapAlloc) is being called. Now digging into the Outstanding Allocation Summary, I find that over 200MB of allocations have been done from my application and all allocations have been done on the heap. 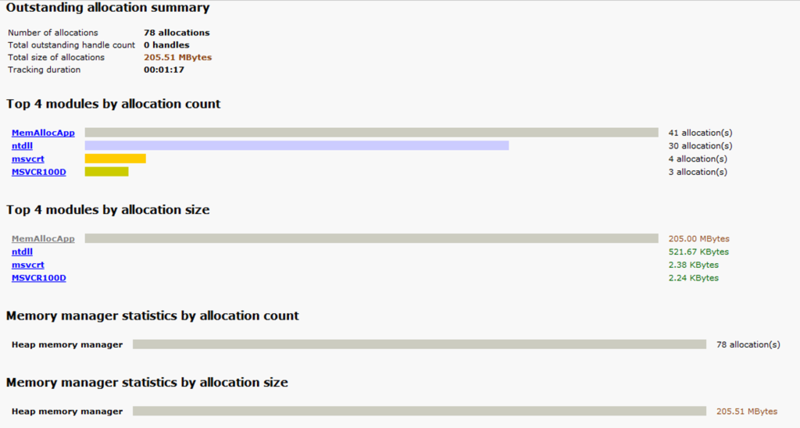 In the Heap Analysis summary, I find that the allocations have all come in from the default process heap. Drilling down into the MemAllocApp hyperlink, I get the offset making these allocations which is MemAllocApp+2cbb. The function details from the report is available in the quoted text below. If I have the debug symbols of the application (which I do), I find that this corresponds to my function call fn_allocatememory which makes 5MB allocations using HeapAlloc on the default process heap. If you align your symbols correctly for the analysis, you will find that the report also gives you the correct function names. So without any debugging commands, I was able to drill down to the culprit making the maximum number of allocations. This can be quite a useful way of tracking down non-BPool (commonly known as MemToLeave on 32-bit SQL instances) allocations when the Mutli Page Allocations don’t show a high count but you are experiencing non-BPool memory pressure. I used the same HeapAlloc function that Sudarshan had used in his latest blog post to explain behavior changes in Windows Server 2008 for tracking heap corruptions. Not so long ago, I had written a blog post for SQL Server myths related to Setup & Service startup myths for T-SQL Tuesday which was hosted by Sankar Reddy (Blog | Twitter). The round-up of the T-SQL Tuesday posts had some awesome content where renowned SQL Community members debunked common SQL Misconceptions. Read the round-up here. I found that that this was quite a compelling topic for a series and decided to do a Part II for SQL Myths around memory related misconceptions. SQL Memory by itself is a murky topic and there are quite a few urban legends that are so well imbibed in people’s memories that we have to battle against them to get users to see light at the end of the tunnel. So, here goes another round of debunking some more misconceptions. SQL Server is a server application. Ideally, you should have a dedicated server for a SQL instance that has a high number of database transactions. If that is not the case, then the Max Server Memory needs to be capped after taking into account the memory requirements for Windows, SQL Server and the other applications on the box. SQL Server (especially 64-bit) is designed to not back off it’s memory footprint once it grows unless it is asked to because of a low memory notification received from the Operating System. The thumb rule of leaving just 2GB for the OS and other applications may not be enough when you have File Copies, SSRS, SSIS and SQL Database Engine running on the same instance. SQL Server 2005 and above is designed to react to low memory notifications sent out by Windows and scale back it’s memory usage as required. Virtual Address Space – Isn’t that an excuse? I can change –g to whatever I want! I am Smart! I will enable /3GB and then increase –g. All problems solved! Lock Pages in Memory is the next best thing after sliced bread! How many times have we heard this: “Enable LPIM for the SQL service account and everything will be alright”! Everything will be alright only when you have taken into consideration the memory requirements for the SQL Server instance(s) on the box, other applications and Windows and then capped the Max Server Memory. Without that enabling LPIM for the SQL Service account is as good riding a bike on the freeway without a helmet. It’s all smooth sailing till disaster strikes! Hope the above points help clear out some urban legends regarding SQL Server Memory concepts and next time during a coffee break or a water cooler discussion, the above points help you convince a *misguided SQL Server expert*! !